Lindsay Tedds from the University of Calgary's school of public policy says the wealthiest Albertans would benefit from the so-called flat tax but the spin-off effects would hurt low- and middle-income earners. A return to the "Alberta flat tax" would benefit only the wealthiest, and the government might then need to boost revenues by cutting programs and adding a sales tax — measures that would disproportionately hurt low- and middle-income people, an economist says. 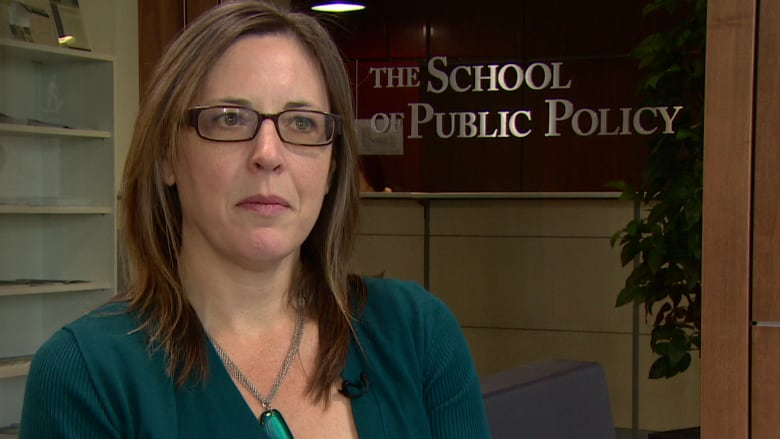 Economist Lindsay Tedds, who focuses on tax policy in her role at the University of Calgary's school of public policy, spoke Tuesday morning with CBC Radio's Calgary Eyeopener after the opposition United Conservative Party voted to adopt the flat tax in its a party platform. The tax had been a fact of life in Alberta for years until 2015. The then-governing Progressive Conservative Party announced it would move from a universally applied 10 per cent tax rate for all income brackets to a rate that would progressively increase with income level. The party was defeated in May 2015 but the winning New Democratic Party agreed with the policy and made it law. This year, anyone who makes less than $128,145 pays 10 per cent; more than that income, they pay between 12 and 15 per cent. "Only those individuals earning above that amount are going to see some impact," Tedds said. "But it's not going to be a large effect on the tax bill unless you are incredibly wealthy and are paying at that 15 per cent rate." Alberta's finance minister has called the idea of a flat tax "risky and extreme," and said it would mean millions in lost revenue each year. The province continues to have among the lowest personal and business tax rates in the country. Tedds spoke with Calgary Eyeopener host David Gray about the spin-off effects of a flat tax. Q: What do you think of the idea of a return to the flat tax? A: It's going to cost the Alberta government revenues, about $800-$900 million at a time when it's running about a $9-billion deficit. There's going to have to be a companion piece to it, in terms of how they're going to either cut spending or raise revenues in a different way. Q: So how do you make up a shortfall of $800 or $900 million? A: It's certainly not going to be in personal income taxes. I think they've also committed to reducing the corporate income tax and the small business rate, which will be about another $900 million. So there's a fair amount of discretion that's going to have to be shown to the spending pattern of the province. Is there room there? Absolutely, but I think we do want to make sure that we don't cut those programs that are most at need for low income individuals and that we look for ways to do it so that it doesn't impede economic growth or people's ability to participate in the economy. Q: To be clear, does the flat tax benefit anybody making under $129,000? A: No, it does not. Q: So it only benefits the rich in this province? Q: Do we know how big that pool is? A: The income tax statistics don't, of course, cut off at levels that are not associated with these tax thresholds. So if we look at the individuals that are making over $100,000 and $150,000, we can deduce that it's about 10 per cent of the income-earning population. So I know your finance minister said it only affects the top one per cent. That's not true. Incomes in Alberta are substantially higher than they are in any other province in Canada, so these tax rates actually affect a substantial portion of your population. Interesting, though, the majority of the people that are in that high income bracket are men and not women, so this is a tax cut that affects high income men with very little impact on women. Q: A free market economist might argue that if you bring in a flat tax, well, that allows more disposable cash for those people who want to spend it. It'll circulate more in society and that tide will raise all boats. Any truth to that notion in your mind? A: No, we have substantial amount of research that has been done on this idea of a rising tide raises all boats. And it's not true. And that is why most governments around the world are moving towards what's called an inclusive growth agenda and this is to ensure that lower income individuals, we reduce those barriers that impede their economic participation. So the downside to the flat tax is your rate is 10 per cent. Individuals at a lower income level face a very high marginal tax rate when they start earning more money. That is actually what we need to be thinking about, is how to ensure that lower income individuals and that people entering the workforce don't face a high tax bracket. You actually get a fair amount of economic growth just by addressing those issues. Q: Alberta didn't invent the flat tax. It works elsewhere, at least it's brought in elsewhere. It's at the higher rate. But you certainly see it in many countries in Europe these days. Why does it work there? They argue it works there but you don't think it would work here? A: I'm not saying it wouldn't work. I'm just saying there are costs and benefits to any piece of public policy. When you look at where it is unfolding in other jurisdictions, they have the different tax mix and they're raising revenues in different ways. For example, in most of European countries, they have a very high sales tax, a dirty word in this province. Q: Would that be the suggestion, if you brought in a flat tax, OK, but then you'd have to bring in another form of a consumption tax, which would be a sales tax? Would that make up the shortfall? A: Sure, but you have to do it in such a way to not have negative impact on the lower income households because a consumption tax does fall more heavily on low-income households. But we address this through the GST through a very rich sales tax credit that is paid out quarterly. It could be paid out even more frequently. But in some way, shape or form, I think we have to understand, Alberta faces a structural problem. It's spending too much and it's not collecting enough tax revenue. So it needs to change its tax policy and its spending policy, both at the same time, for better alignment to achieve the objectives they want to achieve. With files from the Calgary Eyeopener.